Now that the summer has come to a close and the kids are back at school, I begin my summer reading wrap up. First on the list is The One and Only Ivan by Katherine Applegate, which I was lucky enough to find at my local library. This book has won numerous awards and after reading it I can say that it more than lived up to the hype. I remember reading “award winning” books as a kid and for me that usually meant one thing – BORING. What adults deem as a great book many times differs from the attended audience’s opinion. I can attest that Ivan kept me and my reluctant reader engaged and craving more when it was time to turn the lights out for the night. For those who are not familiar with the story, The One and Only Ivan is about a silverback gorilla, Ivan, who lives in a mall with a few other animals. His life is confined to his glass enclosure where kids can gawk at him and do their best gorilla impressions. Ivan is not impressed with humans much, except for the daughter of the mall’s janitor, Julia. The connection she forms with Ivan is beautiful and endearing as they both are able to express themselves through art. While Ivan is not able to communicate with Julia, he is able to talk with the other animals at the mall. The character development of the animals draws the reader in their world, far different than a Disney movie. I felt as if I could truly see the world through their eyes and feel what was in their heart. The animal characters posses a level of “humanity” that aided in the portrayal of the emotional complexity that we cannot always see in animals. The gentle and expressive Ivan feels loneliness, pride, love and sadness and the reader is bought along for the ride. Each time I read the story, I can admit that I had a lump in my throat, and occasionally cried. I know it is not “manly” to admit crying over a gorilla’s feelings, but it is a true testament to Applegate’s ability to convey the depth of his soul. 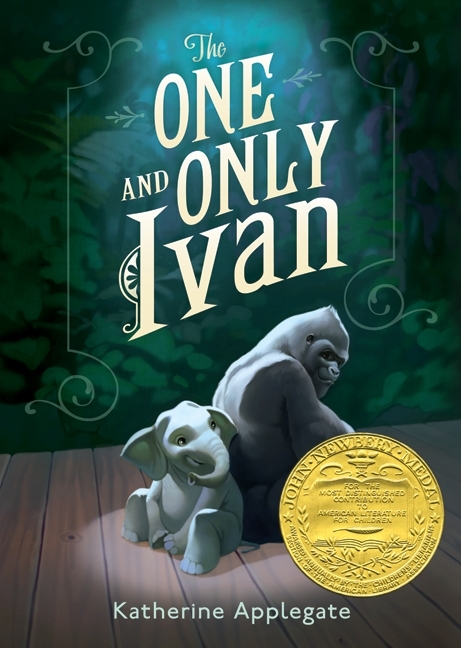 The reader is rewarded with a perfectly satisfying ending where Ivan and his fellow animals find happiness. This has become one of my top recommendations to parents and writers as a story to engage the mind and touch the heart. The next time you are in the bookstore, buy this book for yourself (and share it with your child).